Steller Sea Lion - Steller Sea Lions - Eumetopias Jubatus, British Columbia. 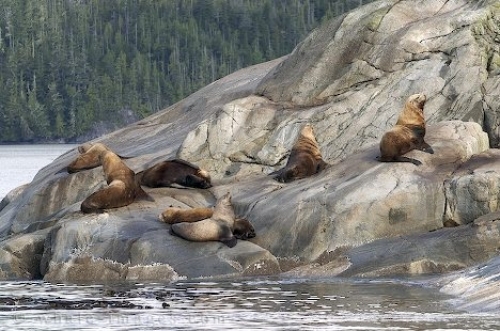 Several steller sea lion males, enjoying a leisurely sunday afternoon bask on this rocky outcrop along the mid coast of British Columbia in Canada. In this picture you can see the beautiful golden colour around their necks, blending to the dark brown on the rest of their bodies. The steller sea lion is the largest member of the Otariidae family as can be seen in this picture.